A moto jacket has, by now, become a closet staple; it is a go-with-everything piece that adds an instant element of edge. I’ve been loosely on the hunt for one for some time now, but wasn’t too enamored by the trendy ones that have come out every season (e.g. studs, bright colours, etc). With its completely basic cut and absence of crazy details, I like that this one, which I recently picked up on sale, will definitely stand the test of time. I’ve also taken a liking to bright, royal blues paired with stark black and white lately, thanks in large part to this photo from Club Monaco, so it only made sense to style the new piece with that in mind for its debut! I’m still on the lookout for blue jeans or pants. This pair looks perfect! You layer so well, miss Jen! I love the moto jacket on you, and I so know what you mean, sometimes it’s so hard to find a perfect basic version of what you’re looking for. Sometimes simple is best! And I’m loving this black/white/cobalt combo! So pretty! love this outfit … great pop of color with those amazing pants!! Great looking jacket. Love how your outfit combines cropped and tunic looks! I hope your week has been great so far… Woo hoo!! We’re half way through. Miss you, love. I really need to raid your closet for coats!!! That club monaco photo is so inspiring! I agree with Kate, about finding the perfect basic. I am slowing working on building my wardrobe basics before I move on too much to the “fun” pieces. Love this moto, but when I looked it wasn’t on sale -wah! I agree it’s the perfect jacket. I too have been on the hunt for one without a lot of loud hardware. Just don’t want to spend over $500 for one. You look adorable as always. Love how you layered the blazer underneath! You are the Queen of Layers. the blue is stunning! and what a great jacket – i never have any luck in aritzia! 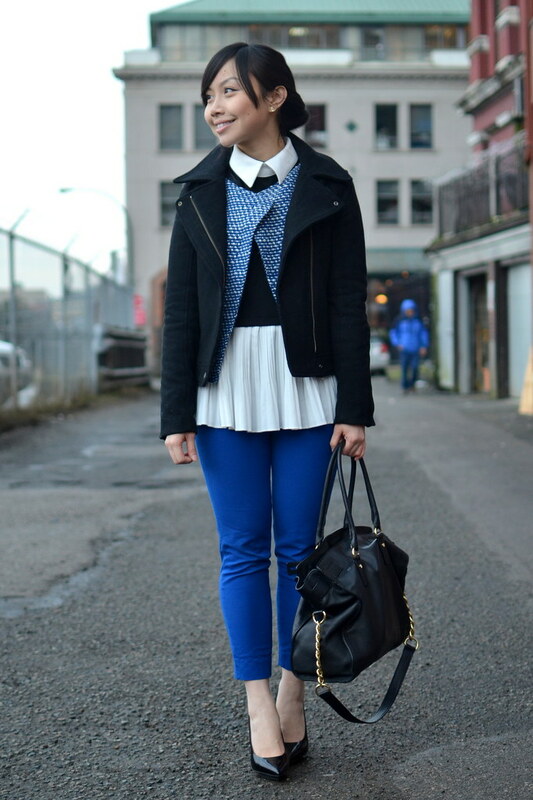 The electric blue is a great colour on you and I like the way you layered your tops to create a subtle peplum effect. Nice look! 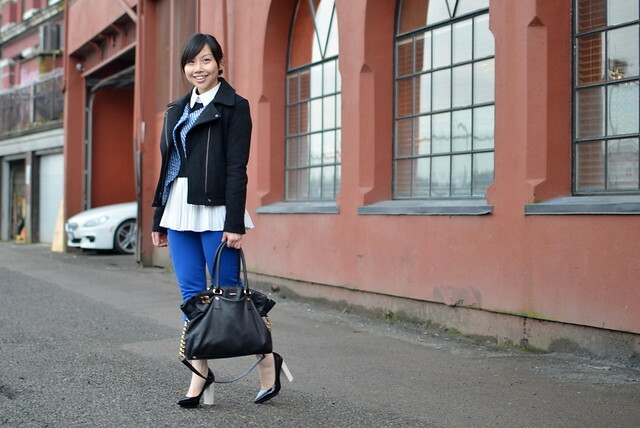 I like the bright blue paired with black and white! I like fashion shoes for women, like http://www.upere.com/upere-wedge-sneakers-c-1.html. I wasnt paying attention .. Great look btw. That is the perfect coat and I’m loving the blue pants, what a fabulous shade!